Our primary service and that which we pride ourselves on the most is the removal of car body dents and creases. These are the ones that appear after a visit to a public carpark. We all try and park away from other cars but unfortunately the careless car park dent monster is at work in the supermarket or work car park. Using our specialised tools coupled with many years of experience, these can be removed very successfully without the need for a costly visit to a body shop, and moreover, at a fraction of the cost. Believe it or not, the body shops use us too! There is no upper or lower size limit to what we can do, dents are like finger prints, they are all different so as long as your paint appears intact then please let us see it before you spend all your hard earned money elsewhere. Our advice is free and impartial. 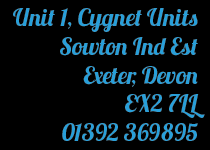 We also offer a range of other bodywork services inc smart repairs, windscreen chip repairs, interior plastic and leather repairs and much more performed by us in house or by our trusted partners elsewhere in the Exeter, Devon area. So if you just want to revitalise the look of your trusty car or are sending a vehicle back from hire or lease then we can help.